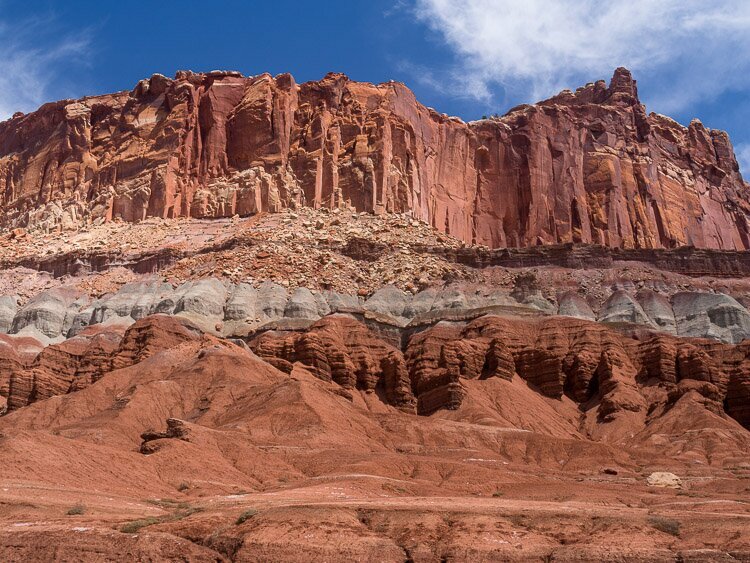 The last major portion of the trip before reaching Capitol Reef involves a traversal of Boulder Mountain, which consists of steep slopes and cliffs with forest and meadowlands on the 11,000 foot top. It is the highest timbered plateau in North America. Route 12, which was only completed in this section in 1985, only gets as high as 9,600 feet, but that’s plenty high enough. It’s 120 miles between Bryce Canyon and Capitol Reef, yet it takes nearly three hours to traverse those miles thanks to hairpin turns through steep canyons and rugged terrain. From here it’s a little more than an hours drive to I-70, and a few hours more to Grand Junction. The scenery is not so interesting as one leaves Fremont River section of Route 24 and heads north toward I-70. But there’s some fascinating places close-by, such as Goblin Valley State Park.